New year, same story: America continued its solid job growth in January. The U.S. economy added 257,000 jobs in January, adding to the gains from last year, which was the best for job growth since 1999. The official unemployment rate ticked up to 5.7%, a notch higher than December. 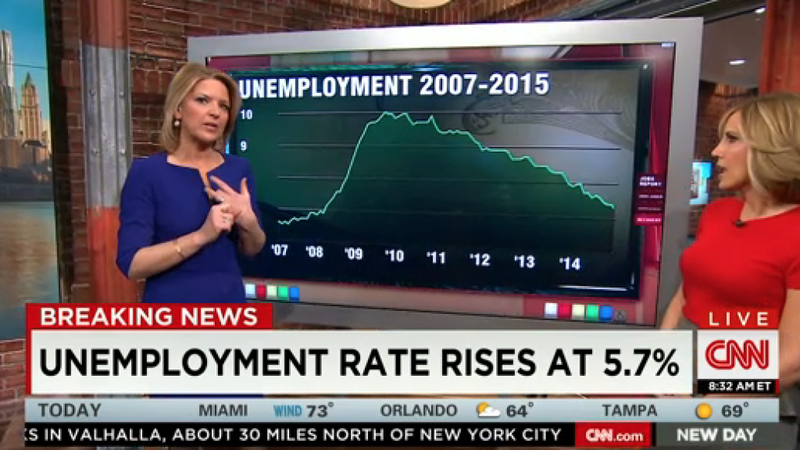 Economists surveyed by CNNMoney predicted 229,000 jobs would be created in January and an unemployment rate of 5.5%. Don't worry too much about the higher unemployment rate. It's actually a positive, experts say. "The labor market recovery is finally hitting its stride," says Gus Faucher, senior economist at PNC Bank. More people are looking for work now as they see others get employment. Faucher believes the higher unemployment rate "is good news. That's a sign of confidence in the job market." The optimism doesn't stop there. There were huge upward revisions to the job gains in November and December. 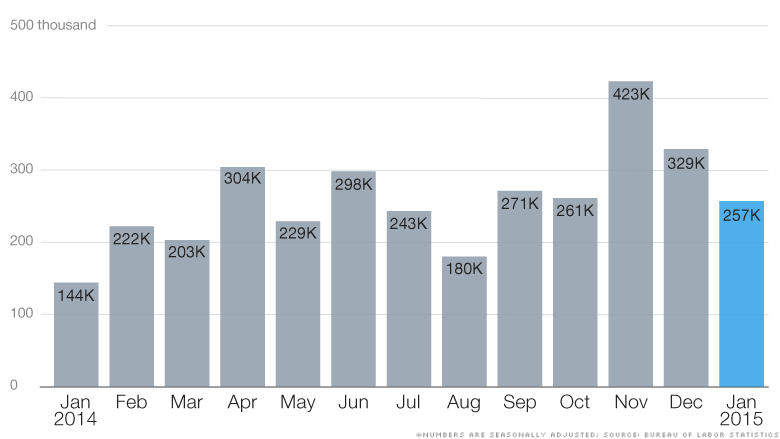 The economy added about an extra 150,000 jobs in those two months combined, according to the Labor Department. "American companies are on a hiring binge," says Sal Guatieri, senior economist at BMO Capital Markets. Headwinds ahead: January's job news was a reprieve from the economy's rocky start to 2015. The S&P 500 (SPX)and Dow (DIA)fell 3% as the strong U.S. dollar is starting to hurt American businesses selling products overseas. There is growing concern that the dollar's pressure could hurt sales abroad so much that it could eventually cause layoffs in U.S. later this year. Some of America's largest employers, like Microsoft and Procter & Gamble, signaled that the dollar may hurt their business this year. Unfortunately, the dollar is not the only concern for the job market. Oil bust: One of the biggest worries is that the dramatic fall in oil prices in recent months will cost many American workers their jobs in the energy sector. Texas, the second-largest state economy, could be hard hit. A number of big oil companies have already announced thousands of layoffs. The economy still added almost 200,000 oil and gas jobs in January, but that is down slightly from December's energy job gains. On the other hand, low gas prices at the pump are giving extra cash to Americans, U.S. Secretary of Labor Tom Perez told CNNMoney. "Consumer spending, I think, will continue to move in the right direction," Perez said, referring to gas savings. "American consumers feel quite good that a gallon of gas is considerably less than it was a year ago because that is money in their pocket." The strong dollar and oil prices are rising red flags, but wages could take center stage in the debate about the economy's health this year, economists say. CNN wants to know: What are your investing questions? Wage gains: Perhaps the best news for many Americans is that wages grew a healthy 2.2% in January compared to a year ago. Last year wages barely rose. President Obama touted wage growth in his State of the Union address, but wages have not changed much for many Americans. The Federal Reserve wants to see consistent wage growth before it raises its key interest rate -- a sign that the U.S. economy is healthy. It aims to see wage growth above at least 2%. In December, wages only grew 1.7% on the year. Some of the wage gains could have come from several states increasing their minimum wages at the start of the year. Over 3 million workers got a raise from the wage hikes. "It's a good [wage growth] number, but I think it reflects the minimum wage increases that were adopted across the country," says Sharon Lee Stark, a fixed income strategist at D.A. Davidson & Co. Looking long-term, she added: "Conditions are indeed improving. The question is how much are we improving from where we came from? The economy took a pretty significant dive. We need numbers like this to pull us back."